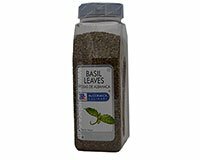 Basil is an essential Italian seasoning. Basil leaves are used to season many savory dishes. Basil Leaves are also known as sweet basil. The basil plant is originally native to India but is now grown in many parts of the world. Use Basil Leaves to season pizza sauce, spaghetti sauce and numerous other Italian meals. 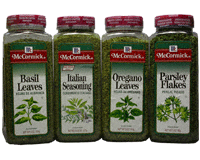 McCormick Basil Leaves are packaged in flavor sealed bulk PET plastic container with dual flip-top lid for sprinkling or measuring. Green Cheese Squares More Recipes..